In 2016, Priyadarshan made a Malayalam film about a blind man (played by Mohanlal) who becomes an unwitting ‘eyewitness’ to a murder. The hero’s visual disability in Oppam was accompanied by a heightened sense of hearing and smell that made him a potential threat to the killer. Now what happens if a killer’s self-preservation instinct causes them to not care that the ‘witness’ is sightless? That question was the starting point of an intriguing French 13-minuter titled L’accordeur (The Piano Tuner) from 2010 directed by Oliver Treiner. Writer-director Sriram Raghavan draws on an atom of just a single element from the French short (which is acknowledged here in the credits), turning it into a full-length Hindi feature that should rank among the most fascinating, fun, funny suspense thrillers ever to emerge from Bollywood. If you are determined to find out what that one element is, you could watch L’accordeur on the Net. You could, but why would you? 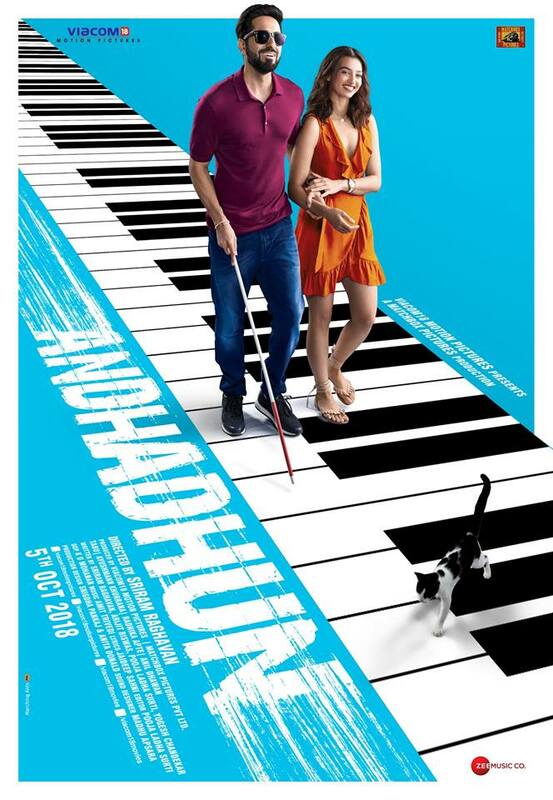 Because even discovering that secret in the opening half hour of Raghavan’s Andhadhun (The Blind Melody) is a pleasurable experience. Here is what little can be revealed of the plot. Ayushmann Khurrana plays Andhadhun’s Akash, a pianist in Pune who is introduced to us as a blind musician trying desperately to complete a tune. Akash is frustrated with the stereotypical expectation that a disability sharpens the creative mind, since he just cannot find the inspiration to wrap up that damned melody. His new friend Sophie (Radhika Apte) is unmoved by his struggle: incompleteness, she tells him, is what gives certain things their finish. In the posher quarters of the metropolis live the glamorous Simi (Tabu) and her wealthy, much older husband, the forgotten Hindi film star Pramod Sinha (Anil Dhawan). Pramod a.k.a. Pammi is stuck in a time warp in which he keeps rewatching his hits, causing considerable irritation to Simi. Her ambition is a career in films and she wants Pammi to use his network to help her. From these unconnected strands is born a black comedy that is breathless in its pace and breathtaking in the scope of its imagination, linking seemingly random occurrences in the cosmos, and with all its entertainment value, arriving at an unexpectedly thoughtful study of both kismet and human nature. People tend to let their guard down with those who cannot see or hear and with children, fear also often causes us to appear guilty of more than what we have done, and the writers play around gleefully with these truths. The premise is completely wacko, a what-if to beat all what-ifs. It is also familiar terrain for Raghavan whose films Ek Hasina Thi, Johnny Gaddaar and Badlapur are a testament to his fixation on evil crackpots and cold-hearted criminality. The story by Hemanth Rao and Raghavan himself has been expanded into a multi-layered screenplay by the latter with Arijit Biswas, Pooja Ladha Surti (also the film’s editor) and Yogesh Chandekar. At one level, the result of their collaboration is a hugely enjoyable, fast-paced thriller, but at another it is a quietly observant tale reminding us that however convinced we may be that we have outsmarted fate, the universe is always the boss of our lives. It takes a bunch of nutty, unfettered actors to put their faith in this nutty, impertinent script. As it happens, the cast and writing of Andhadhun are made for each other. Very often, a character’s disability becomes a crutch that actors lean on, letting that aspect of the part overshadow their entire performance. Khurrana is not that kind of artiste. While he does not stumble even once in playing blind, he is just as effective in conveying Akash’s amorality, affections, aspirations and fears. In a smaller role, Apte exemplifies guilelessness and innocence that are a refreshing contrast to the machinations all around her. The supporting cast is impeccable, never once faltering when the storyline takes them to places that lesser actors could have reduced to a farce. Kabir Sajid – the darling little boy from Secret Superstar – beautifully, albeit briefly, plays a child in Andhadhun who epitomises the moral ambivalence of most characters in the story. The queen of all she surveys in this film though is the tremendously gifted Tabu, whose chameleonesque talent is put to great use here as she plays a woman with many faces, a creature with a steely grit, capable of vileness, yet in possession of very human vulnerabilities, still yet capable of discussing the foulest of her actions with such casualness that it is impossible not to laugh. The manner in which Simi/Tabu switches from one emotion to the next to the next, at one point her face and voice conveying completely different feelings, is a sight to behold. Terrible things happen in this film, yet it manages to tread lightly throughout. This overall effect and the build-up of suspense are a consequence of the smooth interplay between Raghavan’s purposefulness, K.U. Mohanan’s clever camerawork (what he hides being as important as what he chooses to show), and the intricate sound design by Madhu Apsara. The weave is tied in by Amit Trivedi’s well-conceptualised soundtrack, the thoughtful mix of original songs and re-runs of classics, and Daniel B. George’s background score. Few musical instruments can match the piano in its ability to build up an atmosphere of intrigue. Soulful, robust and sharp, it is a constant companion to the twists and turns in this madcap movie. The music, like the film in its entirety, is a tribute to 1970s Hindi cinema, the point driven home all the more sharply by the decision to cast Anil Dhawan as Pammi. Dhawan shone fleetingly on the big screen in real life in that very decade. Snatches of scenes from his actual films are played in Andhadhun, lending an air of poignance to his character’s journey and nostalgia to the film as a whole. 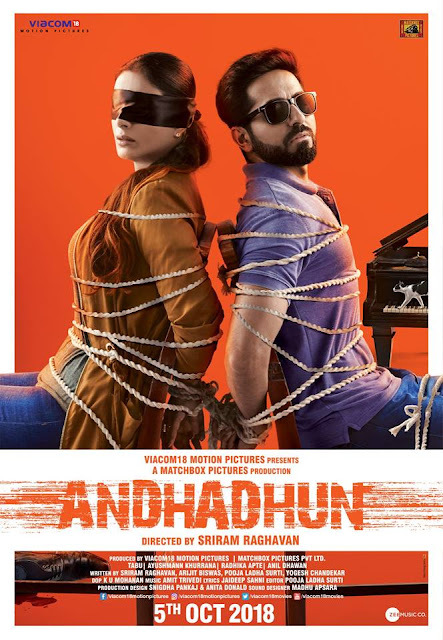 If you plan to watch Andhadhun, make sure you arrive early so that you do not miss the prologue or the old-fashioned credits, along with the bizarre statement accompanying them on screen, plus the tribute to Vividh Bharti’s Chhaya Geet and Doordarshan’s Chitrahaar. It all counts, as does every minute, second and milli-second of the unpredictable, crazy ride that follows.